The Ariens all-steel construction alone is enough to beat out the competition. But that’s not the only feature that sets Ariens Two Stage snow blowers apart. They can throw snow further than your average snow blower, which means you can clear a path and throw the snow where you want it, no matter how wide your driveway is. Watch the video below to see the Ariens snow blower in action versus snow blowers from other brands. Need more power from your snow blower? Check out the Ariens Professional 32 Two Stage Snow Blower. With electric start using a 12V battery, this snow blower starts on the first try, no matter how cold it gets outside. Deep snow drifts are no match for this professional model snow blower. It can throw snow up to 50 feet and clear a 32-inch wide path. Handwarmers, automatic traction control, and a powerful in-dash headlight come standard on this snow blower. The heavy-duty cast iron gear case is solid enough to last for years of use. Get your Ariens Professional 32 Two Stage snow blower now! Free shipping on all orders to the lower 48 U.S.
Bring on the snow. With the Ariens Platinum 30 snow blower, your driveway and paths will be cleared out in no time. The 30″ wide clearing path requires fewer passes up and down the driveway, and with a snow thrown up to 50 feet, you can easily clear snow out of the way. Ariens snow blowers are made with a heavy-duty cast iron gear case that stands the test of time. A 342cc Ariens Polar Force Engine gives you all the power you need. Get dependability you can count on with an Ariens Two Stage Snow Blower from SnowBlowerSource.com! You’ll get the best pricing around, fully insured shipping at no extra cost, and shipping that’s faster than our competitors. All items shipped via freight are scheduled for delivery time with the customer (nobody likes surprises). All our items are shipped via FedEx. Order your snow blower today! Watch this Ariens Two Stage snow blower review video by ToolSelect.tv to see how this snow blower can blow away your expectations. In this video, Jesse, a genuine homeowner and self-proclaimed “tinker” with engines, gave the Ariens Two Stage 921022 snow blower a 5-star rating for performance, design, quality, and value. That’s a review you can’t beat. What’s so great about the Ariens Two Stage Deluxe snow blower? Well, for starters, it’s got an electric start that fires up the engine no matter how cold it is outside. Leave the shovel in the garage and get the job done faster with the Ariens Deluxe 28 Electric Start Two Stage snow blower. Electric Start: Snow blower doesn’t want to fire up? Just plug it in and use the electric start. 250cc Motor: More than enough power to get through the end drive after the snow plow’s gone by. 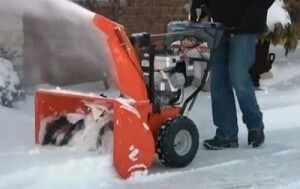 Ditch the shovel and save your back with an Ariens Two Stage Snow Blower from SnowBlowerSource.com! Our pricing is typically the best around. Every product we ship is fully insured, and we don’t charge extra (like our competitors do) for this service. Our shipping and transit times are faster than the competition. All items shipped via freight will receive a phone call to schedule a delivery time with the customer (nobody likes surprises). All our items are shipped using FedEx. Order yours today!